How much power does Sierra Madre city council have over it's citizen's? "just walk in to the light". Can officers carry people across the street? No, they would outsource Is that like they do parking ticket payments. The city would put out a call for volunteers. When I use a crosswalk on SM Blvd, I have to yield to cars 30% of the time. They just see pedestrians. Baldwin is a little safer. Officers can do what ever they want. Just like our president. Next expenditure, stop lights on every corner. There are a couple of street crossing in town where this would be of use where there is serious congestion from time to time. Otherwise they are electronic clutter. When I cross the streets downtown cars stop and let me go by. This kind of courtesy has always been a part of Sierra Madre. People who have lived here a while will stop, but those passing through will not. I frequently cross the Blvd., but not without waiting to see the drivers see me and start to slow down. What effect will these pulsating lights have on people with epilepsy? Photosensitive epilepsy is when seizures are triggered by flashing lights or contrasting light and dark patterns. Photosensitive epilepsy is not common but it may be diagnosed when you have an EEG test. Flashing or patterned effects can make people with or without epilepsy feel disorientated, uncomfortable or unwell. Flashing cross walk signs are everywhere. Minute count downs blinking as the walking period ends. In our town, if there were some well placed solar powered crosswalk signs, it would not be any more problematic that any other cities where photosensitive individuals negotiate the world. Claremont opted for talking electronic street crossing devices because of epilepsy concerns. I believe they were also concerned about the blind. That lets the person in the crosswalk know they have x amount of time to get across the street, it does nothing to make the driver anymore aware that there is a person in the crosswalk. Residents can do whatever they want, like remaining focused on their cell phones when stepping into traffic with out looking. Even our President puts down his cell pnone and stops texting when he is crossing the White House lawn. History will record it as his biggliest accomplishment. I'm not sure Donald will be allowed to Tweet when he is in prison. Less photosensitity with flashing safety lights, than when entering a brick and mortar store with florescent lights. Would recomend not attending a lazerium light show if you have light sevensity. For about 3% of people with epilepsy, exposure to flashing lights at certain intensities or to certain visual patterns can trigger seizures. This condition is known as photosensitive epilepsy. Photosensitive epilepsy is more common in children and adolescents, especially those with generalized epilepsy and a type known as juvenile myoclonic epilepsy. It becomes less frequent with age with relatively few cases in the mid-twenties. Many people are unaware that they are sensitive to flickering lights or to certain kinds of patterns until they have a seizure. They may never go on to develop epilepsy with spontaneous seizures. They could just have seizures triggered by certain photic conditions. Many individuals who are disturbed by light exposure do not develop seizures at all, but have other symptoms such as headache, nausea, dizziness, and more. They do not have epilepsy. Some people wonder whether flashing lights on the top of buses or emergency vehicles may trigger seizures in people with photosensitive epilepsy too. Where is all this new found money coming from? The new UUT tax base? does the crosswalk sign salesman have family that collects trash and sells carpet? "Peace over Violence", the group is calling attention to Domestic Abuse from Smart Devices. Does your thermostat turn up by itself? Do your electronic door locks now keep you from entering your house? How about your "smart" home sound system? Ever get a blast of sound at 3am? New way of driving your ex crazy, the "smart" way! How does all this cell phone smart work when the cell towers are down in a power outtage or use overload ? Large drones called Dragonflies carry pedestrians to safety high above the streets. Some of us prefer being carried across by Mothra, before the streetlights turn on, of course. True 9:43am. CLIMB in Sierra Madre would benefit from the talking street crossings; dont expect our City Council to be sensitive to that population, they will vote for "flashing" the residents! Sierra Madre does have blind community. Why would safety equipment like this only be for the sighted? Is there no sound element? Not in the staff report. The report is mostly the consultants findings, and the needs of the sight impaired were not taken into account. A 155mm field gun would stop a car. Of course, just about any gun would incapacitate the driver, but the car might go out of control. You know 9:11am. The flashing lights over exit signs located inside a business and or schools are for the hearing impaired, when the emergency warnings are sounded, the flashing lights are also triggered. Herein lies the truth of this council. Spend gobs of money on a study for safety and exclude the multi disabilities community that have been a part of this community well over fifty years. This is how our UUT money is spent. Historically the Fire Horn is the earliest emergency warning system in California. I think a 155mm field gun would stop that, too. Maybe I'm feeling nostalgic thinking about the 49th anniversary this week of the Apollo moon landing, but the flashing crosswalk sign and other pedestrian (pun intended) must have conveniences remind me of the last line of this old toy commercial. 11:12pm your tombstone will read, "forgot to look both ways before stepping into traffic". Yours will read “can’t tell time”. Astronomer Neil Armstrong; "that's one small step for man, and one giant leap for mankind". Because 6:29 is so cool under enormous pressure, he wouldn't have omitted the article. 6:29 is THAT good. I am against this. 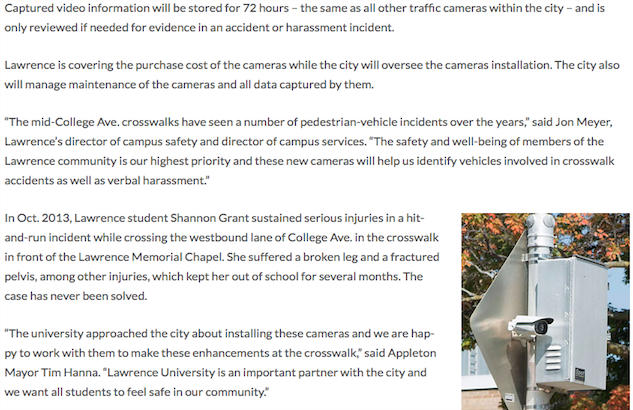 I am distrustful that the council will add cameras at a later time. It's too Big Brother for me. I'm against this. I'm concerned the council will later allow cameras. Too big brother for me. The ones on Claremont yell at you. Big Brother, Big Brother, just another Sierra Madre scam on collecting money. Snap a photo of a jay walker, then mail the ticket to their home. The facial recognition technology software will help ID. This council has spent the same, if not more, than the shenanigan years. Ten or twenty smart water meters = hundreds of thousands of dollars. Two smart flashing signs, walk, dont walk = thousands of dollars. Leaky water pipes, hundreds of thousands of millions of dollars. Increase in employees wages, priceless. Pay ahead Calpers remortage your house.